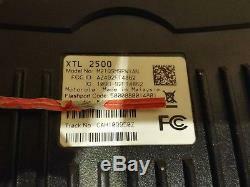 Motorola XTL2500 - UHF - 380-470 MHz - Remote Mount - M21QSM9PW1AN - BRICK ONLY NEW PRICE. Radios were recently removed from service for an early system upgrade to phase 2 / apx. 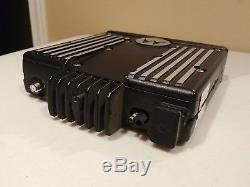 Radios are 380 to 470 MHz. M5 remote mount head (configured for, not included). Legitimate flashcode, legit tags (tags match). Firmware is R15 most units are R15, some are higher or lower.. Like R12 or R18 etc. PLEASE NOTE THAT NO REMOTE HEAD, OR CABLING IS INCLUDED!!! RADIOS WERE ALL TESTED AND IN WORKING ORDER. HLN6863 or PHLN6863 (D connection / ignition sense). D12 B1 G806: ASTRO IMBE Digital Operation. D12 B3 G114: Enhanced Digital ID Display. D8 B4 G996: Over the Air Provisioning. D7 B4 G51: SmartZone Systems Operation. D4 B1 W947: APCO Packet Data Interface. D3 B3 G173: SmartZone Omnilink MultiZone Operation. D2 B4 G361: ASTRO 25 9600 Baud Trunking. Please note that you will require a HLN6863 or PHLN6863 / ignition sense cable to power up these radios. 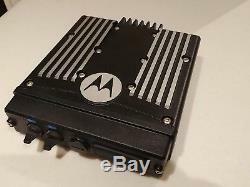 The item "Motorola XTL2500 P25 Digital UHF Radio M21QSM9PW1AN Remote Mount" is in sale since Saturday, June 9, 2018. This item is in the category "Business & Industrial\Facility Maintenance & Safety\Surveillance & Alarm Equipment\Two-Way Radios". The seller is "ewastesuperstar" and is located in Scarborough, Ontario.